In 1983, the second English translation of the pastoral care rites was released for liturgical and pastoral ministry. These rites deal with those who are sick or dying, and their loved ones. The following outline covers about a hundred posts put up on this web site in 2008-09. Part III readings, responses, and verses from Sacred Scripture. Having this available online will be a great service to Catholic people, one that I would gladly promote the use of by parishioners. I find that Catholics are often not well informed about the range of ministries and rites which the Church now provides, and about when those are most fruitfully requested. We will get the outline and links up soon. I had completely forgotten about this. So glad to find this version. 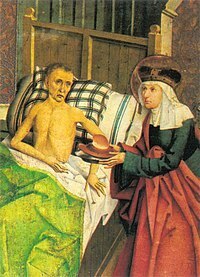 I would appreciate it if anyone could direct me to the best use of this liturgy or preparation for it (within the two stage process of care of the dying) by a lay chaplain who would have access to a priest who not always be available immediately or with so much time to spare as a chaplain might have to offer the patient in hospital some preparatory comfort. From: An apprentice chaplain. (23 March 2013)..
My suggestions would be to review PCS 42-46 for general objectives. Regular Communion, even daily, for those terminally ill (PCS 71-96, adapted with appropriate Scriptures for the situation) was my practice when I was a pastoral associate. Thank you so much, Todd! Will let you know how I get on with my review, Angela. Thanks for making these materials available online; it is truly very helpful for those who are in the ministry of the sick. God bless!